Having recently shared a lot of gorgeous shots of our trip from San Diego, California to Cabo San Lucas, Mexico, I thought I'd go for a nitty-gritty post next! Folks often imagine that a cruising life is largely leisure -- and all the cruising sailors reading that are laughing their asses off. Maintaining an actively ocean-going sailboat is a lot of work! We've yet to have a major emergency, but most days include time doing maintenance, minor repairs, or improvements. Here's the story of one of our recent-and-future projects. During the Ha-ha, we ran our engine almost constantly. It's not common to run the engine 24/7 for days on end, so James was keeping a close eye on ours. James would check on the engine periodically while underway, opening the door of the engine room to be sure that things looked, sounded, and smelled as usual, and then he'd make a closer inspection each time we anchored and the engine cooled down enough to allow this. 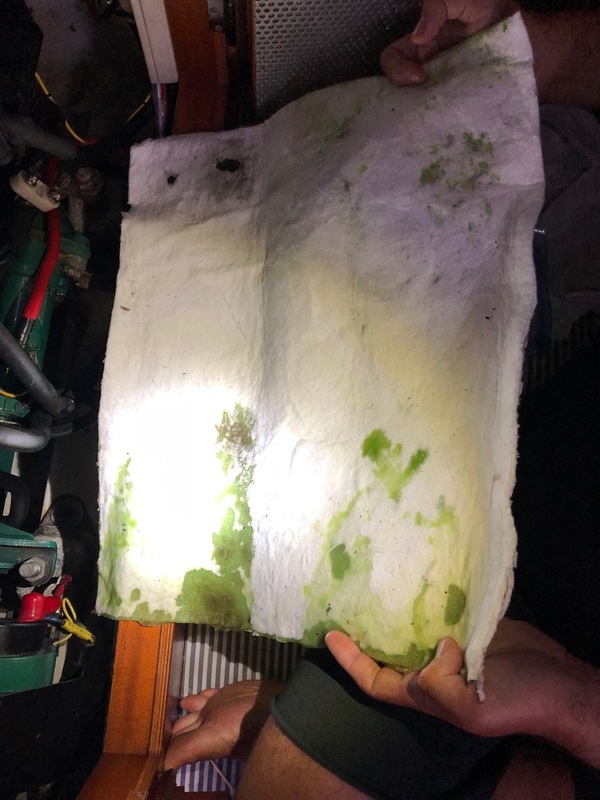 When we arrived in Bahia Santa Maria, James found engine coolant on the diaper (a disposable absorbent pad you lie under your engine). The cause of a coolant leak can be minor -- a leaky hose -- or major -- a blown head gasket-- so we were not overjoyed, but the engine was running flawlessly and its temperature was perfect, so James topped the coolant up and increased the frequency with which the person on watch was to check the temperature, and we carried on. 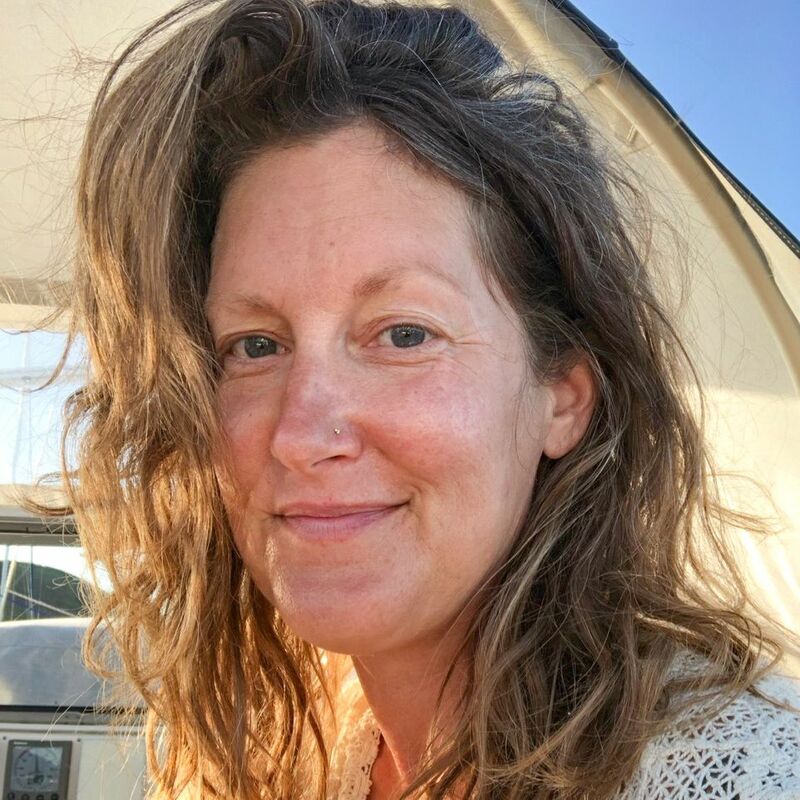 As we sailed on from Bahia Santa Maria to Cabo, everything continued to function perfectly, but upon arrival, there was a whole lot more fluid on the diaper. We now had internet access, so James was able to research. He discovered that our engine is known for liking a little less coolant than it says -- if you fill to the line, it spits some out. It seemed likely that we were just seeing the fluid we'd added, then, rather than a worsening problem, since function and temp were great. While we were in Cabo, wome sailing friends (Hi Stephanie and Greg!) who came to Cabo to jump onto a boat heading up to Loreto invited me to join their provisioning run to Costco. I was surprised to find some lovely produce. I also I stocked up on tocino (bacon!) and of course got a case of Topo Chico, a Mexican mineral water which we adore. There was a hose with some coolant drippage, so we're pretty sure our coolant leak is due to a mixture of this engine not wanting to be fully-full and a little leak on the hose. WOOHOO! As we travelled down the coast with the Ha-Ha, one of the problems we heard about most from other boats on the morning net was impeller issues. This made James extra happy with his choice to kit our water pump out with a Speed Seal, an awesome cap designed to make checking on your impeller, which can freeze, crack, or get fouled with goo, easy. James adores the Speed Seal! The four bolts that hold it on need to be tightened in a specific order, though, and on his last check, James had gotten the order wrong, so the cap wasn't perfectly tight. Totally unrelated to the coolant leak, just a little human error. If that impeller stuff sounds like gobbledy-goop to you: a running engine generates heat. Sailboats cool their engines in part by sucking up seawater and pumping it through the engine. The impeller is a little finned wheel that pushes (impels) seawater from the water pump into the engine. So when James failed to get the impeller cap on snug enough, salty water leaked down the back of the engine, causing the rust he'd spotted. Hopefully, the solutions here are not expensive or time-consuming: James will paint the part of the engine that got a salt water bath with a substance that stops the rust, then add fresh coat of paint. He'll replace the clamp and/or the hose that's leaking coolant. TADUM! But: there we were, in Bahia Los Frailes, which has a live coral reef, and our engine room contained a bunch of sea water which was tainted with engine coolant. ACK! This is why I mentioned Costco earlier. We'd eaten most of our provisions during the Ha-Ha and now had just a few days of food for two people onboard. Since I cook most of our food from scratch and then store a lot of it in the freezer, I now had a lot of empty jars on hand. 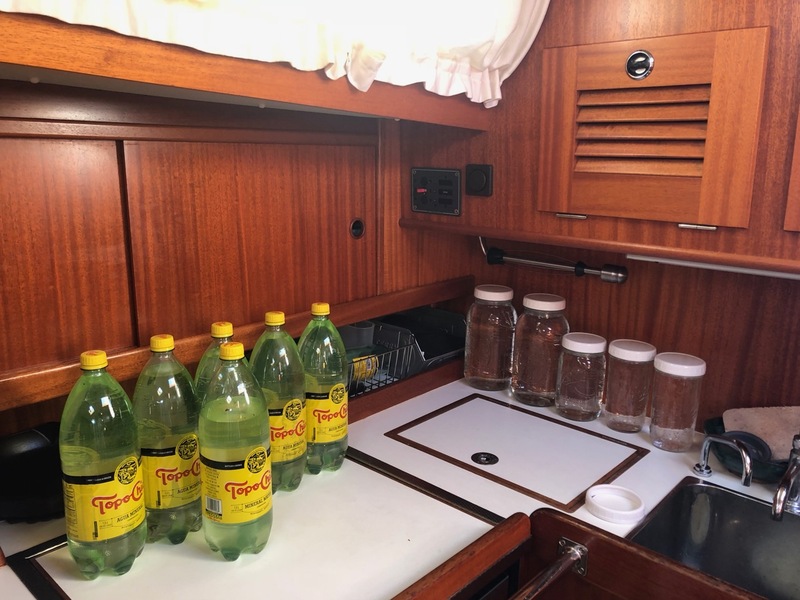 I emptied our treasured Topo Chico supply into the empty glass jars and James used a hand pump to get what I from then on referred to as our "Seawater Engine Coolant Agua Fresca" into the Topo Chico bottles. This allowed us to carefully store the, ahem, "Agua Fresca" until we reached land without risk of the containers breaking. As I've said before: the hardest in some ways and happiest in other ways our life has ever been.